Boxcutters, Teaspoons, Jigger, Citrus Juicer, Strainer, Stirrer (long Spoon), Rocks Glass. Add first four ingredients to a rocks or old fashioned glass and give a quick stir. 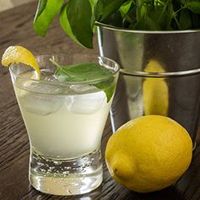 Add ice and garnish with lemon peel and a bruised basil leaf.